Open and dynamic, the alterations and additions at the Dancing House, work in elegant counterpoint to the existing cellular Californian Bungalow. 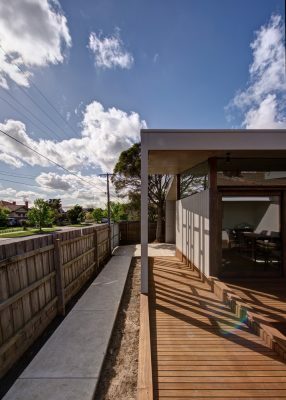 Inspired by the Client’s fondness for tranquil, forested clearings, the interplay between the new and existing frames three courtyards which orchestrate an unfolding engagement with the nuances of nature and the site. Imbued with characteristic monikers such as the sun terrace, bridge, and forest courtyard, these courtyards, when fully landscaped and planted with trees, will invite the Clients to interact with the site in all its diverse aspects, whilst providing abundant daylight and cross ventilation. 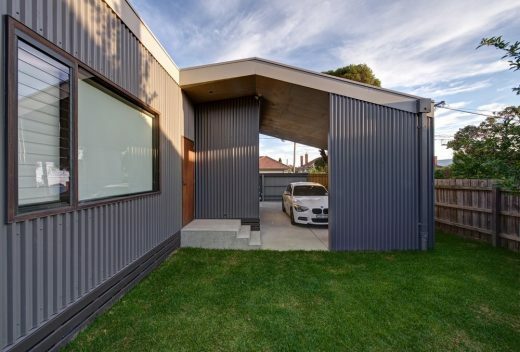 integrates the carport, and provides an implicit link to the rhythm of the existing roof. Catering to a disabled client, a new accessible bathroom and kitchen have been provided linked by skilfully integrated ramps throughout the key threshold spaces. protection to the sun terrace. How did you realise the architectural concept? Inspired by the Client’s fondness for the tranquil, forested clearings, the alterations and additions at the dancing house work in elegant counterpoint to the existing house to reference this experience. 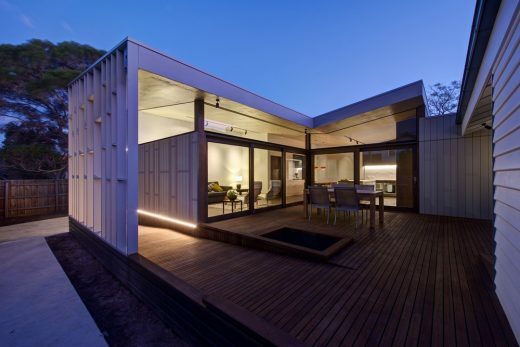 Featuring 3 courtyards, the additions orchestrate an unfolding engagement with the site. The existing house is an elegantly proportioned Californian Bungalow that sits at a low reposed profile on the site, working in elegantly to the well planted garden. 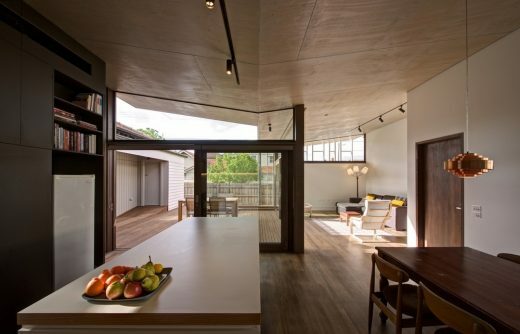 Respecting the nature of the house, it was acknowledged that the cellular nature of the house should be retained and would be contrasted by the light, open fluidity of the new additions. 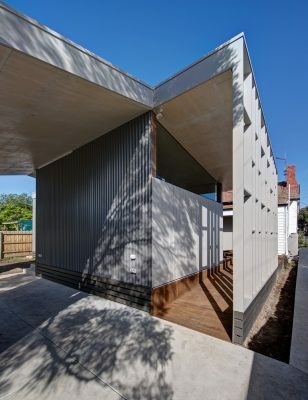 In counterpoint to the existing house, the new addition has a permeable, open character. 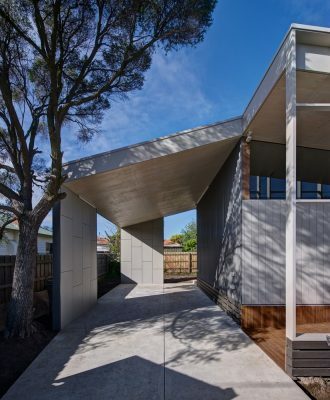 Respectful of the integrity of the existing house, the new addition connects delicately to the existing house through a bridge corridor, creating a transition between old and new. 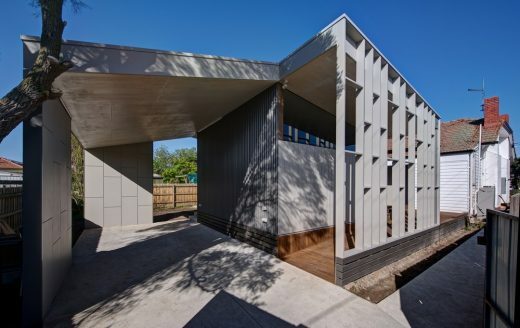 This detachment also created the opportunity to realise interstitial courtyards between the new and existing spaces. Rather than a closed form on the site, the open plan living zone is composed as an L-shaped zone to help define a series of 3 courtyards, and extend across the site. Imbued with characteristic monikers such as the sun terrace, bridge, and forest courtyard, these courtyards seen holistically will allow the Clients to interact with the full dynamic range of characteristics within the site. The sun terrace will have a single feature tree which will create dappled light and also provide a degree of screening from the street. In contrast, the South facing bridge courtyard will encourage a fernery style of planting, whilst the forest courtyard is designed to be densely treed to the boundary to create a sense of ambiguous visual depth. By focusing on experience over form in the additions, the house becomes an elegant and complementary interplay between the cellular existing house, and the dynamic experiential courtyards of the new addition – a dancing house. As the Client is wheelchair bound, an important consideration was enabling full accessibility throughout the site. 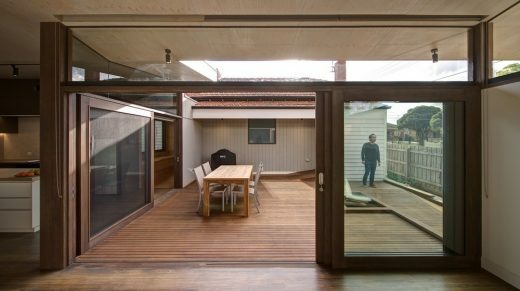 Small ramp transitions were skilfully located throughout the plan to allow contiguous access from the front door to the carport. 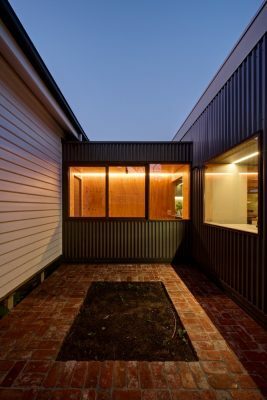 An accessible bathroom was designed into the former kitchen of the existing house, and is lit by a window that draws light from the terrace courtyard. 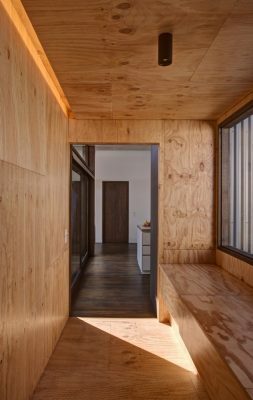 To lend subtle definition and intimacy to the open plan living spaces, an undulating gable roof plane structure lined with grey stained plywood is adopted. 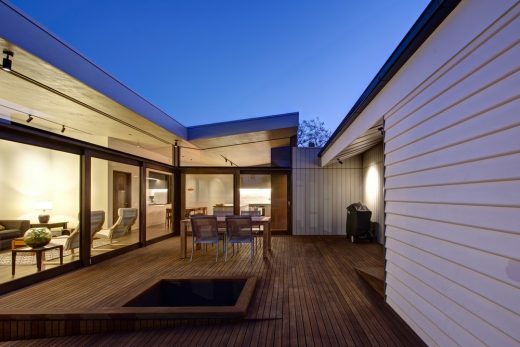 This roof extends out to integrate the carport, which in turn helps provide definition to the forest courtyard. 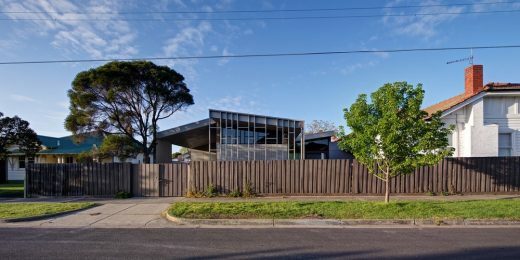 The rhythm of the roofs allow the new addition to harmonise with the hip roof form of the existing house, and also provide a reference to the gable and hip roofs that characterise the neighbourhood. 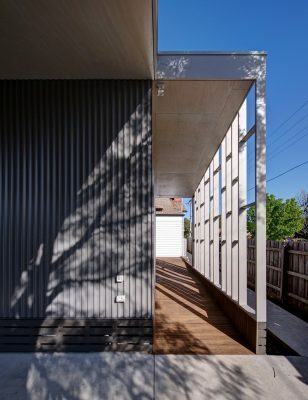 Cognisant of addressing side street elevation, an elegant painted timber screen to the courtyard ramp, aligns with the wall of the existing house, and provides a sense of urban scale by acting as a balanced counterpoint to the mass of the existing house. 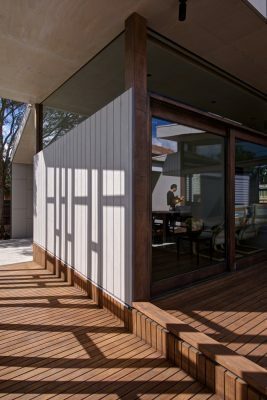 Conceived as a transition to the heart of the house, the exterior of the design is clad in grey vertical Spandek metal lining, and through the agency of the side access ramp and screen, transitions to the painted timber lining and warm stained timber windows, columns and decking to the central courtyard, signifying the warm and tactile centre of the home. 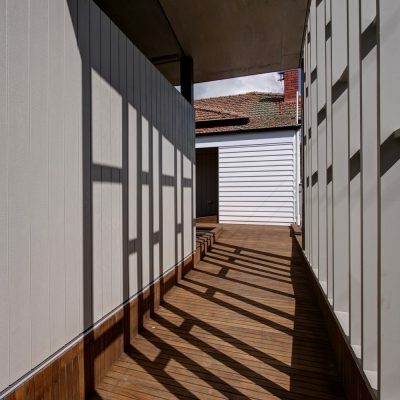 Internally, the bridge corridor is lined with clear sealed plywood, and with a view of the planting in the bridge courtyard, provides an activation of the senses as part of the threshold experience. 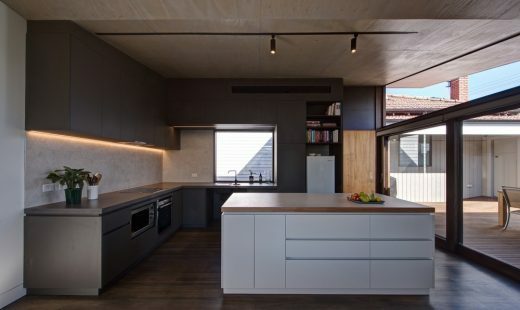 To the living area, the darker kitchen joinery, and the folds of the ceiling, provide definition between the kitchen and dining zone. Glazed sliders enwrap the sun terrace, and work in counterpoint to the framed views of the bridge and forest courtyard from the kitchen and dining respectively. 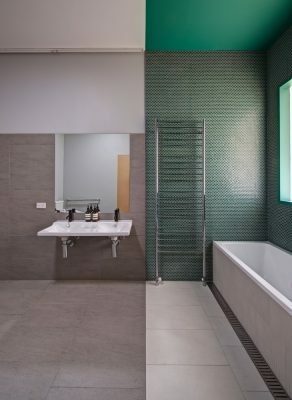 Within the existing house, the bathroom built for use by the disabled Client, is conceived as a neutral space with an intense zone of colour to the wet area, marking the connection with the central courtyard through the frosted window. In this way, the central sun terrace becomes a communal, gathering device for all of the surrounding spaces. Whilst not yet fully landscaped, the future realisation of trees and greenery to the three courtyards will fully activate the design, add nuance, and allow the site to be understood in all its diverse aspects. What was the client’s brief for the project? One of our Client’s was in a wheelchair, which meant that the alterations and additions needed to allow full access across the site. Ramps needed to be integrated throughout the design, as well as a fully accessible bathroom, kitchen, and carport. 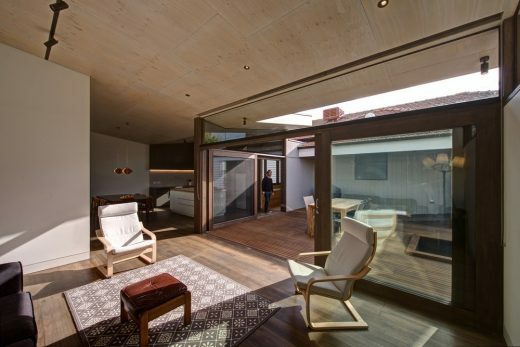 Besides that, the project asked for a expansive living area that connected with the back garden. Our solution, was to break the site into discrete courtyards, so that the design essentially articulated all aspects of the site, rather than imposing a form onto a garden. Were there any particularly memorable moments throughout the project process? Any funny/interesting stories? We always feel that the best brief is an experiential brief. For this reason, we ask the Client’s to provide us with an understanding of their favourite experiences. When we first met the Clients on the site for a briefing, we were wondering through the heavily planted front garden. Part of the garden had a small paved clearing, which felt quite enclosed and intimate. And yet, it was only about 2m from the front fence. Unfortunately, a lot of this front garden needed to be replanted, due to drought damage, but at least it did provide the catalyst for the design. The Client’s expressed how much they appreciated forest clearings and spaces exactly like this, that brought them closer to nature. So this became the catalyst for the design concept. We focused on the idea that the house design would choreograph an unfolding experience of the site, which would be structured around a series of intimate courtyards, with differing characteristics. By creating this journey, we hoped that the clients would experience all aspects of the site, arrousing their senses, and becoming more aware of their relationship to nature and the site. 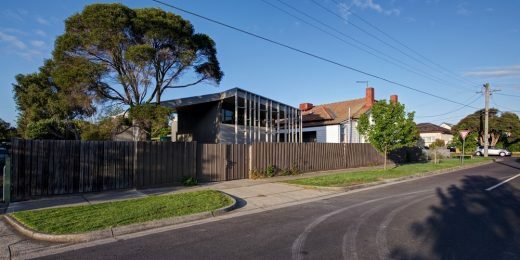 What is the house’s relationship to the context? 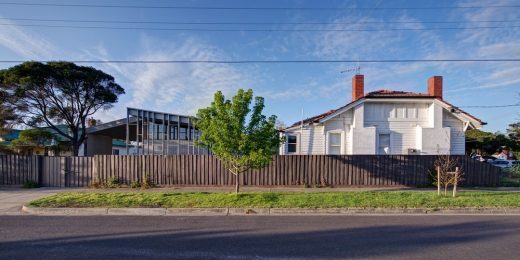 Acknowledging the corner location, the Dancing House additions utilises a floating, pleated roof to address the site context and urban scale. 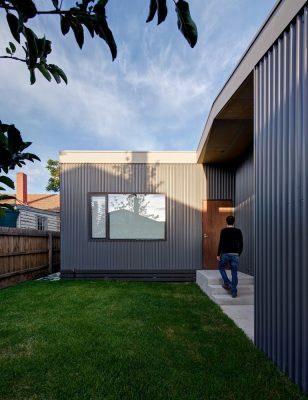 The pleated roof harmonises with the gable roof of the existing house, and references the gable and hip roof rhythm that characterises the neighbourhood. 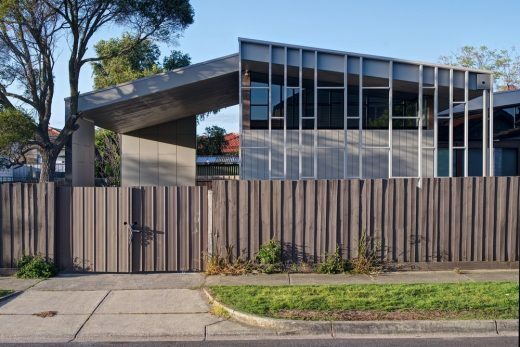 To the side street, the elegant painted timber screen to the courtyard ramp, aligns with the street edge of the existing house, and provides a sense of urban scale by acting as a balanced counterpoint to the mass of the existing house. At night it glows as a beacon to passersby on the street. Cost/value outcome – how effective were the decisions related to financial issues? 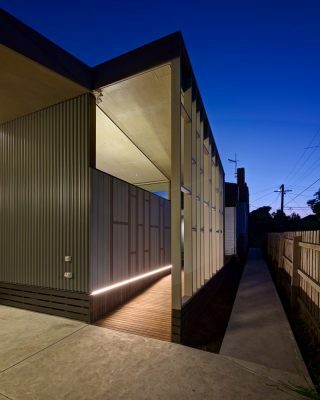 Based on a modest budget, the design was realised with humble but well detailed finishes and simple timber construction. 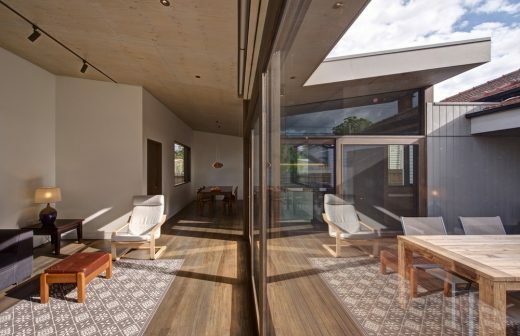 Focus on the spatial ambience of the 3 courtyards, ensured that the design was based around experience rather than form. 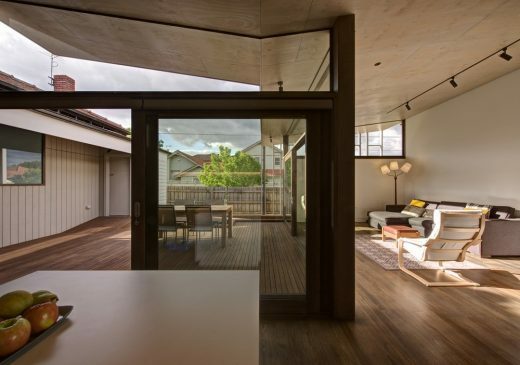 The interiors of the existing house interior were renovated by the Client’s father to ensure that the budget could be used efficiently on the new additions. Similarly, the Client plans to slowly phase in the landscaping and trees during the appropriate seasons of the upcoming year. The outcome achieves a sense of expansiveness tailored within a reasonable budget. What fixtures and finishes were used? Ramp Screen – Painted Pine Framing. 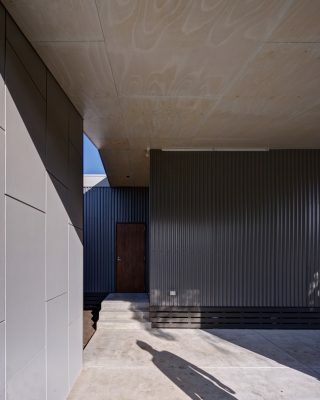 Garage Fin Walls – Painted Fibre Cement Sheet with Expressed Joints. Clerestorey Glazing – Frameless structural silicon fixed glazing. Track Spotlights, LEDs and can downlights by AT Lighting.